Create great looking programs immediately...No special skills needed! Uses common software such as in Microsoft Word, Publisher, Pages or OpenOffice. 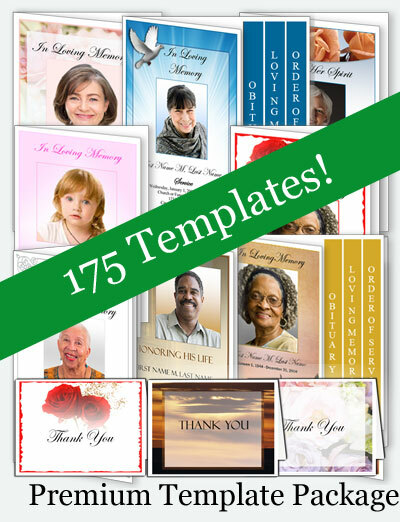 Layouts Bifold, Trifold, Graduated and 4 Page Graduated Fold, Large (Tabloid) and Cards. Here are some quick tips to help you get started planning your new business! If you are considering starting a business creating funeral programs, you may not know where to begin. Here are some quick tips to help you get your business started, so you can begin making money creating funeral programs for clients, friends and family. Yes, this is a very obvious thing to do but it is very important. Giving your new business a name really helps your dream of having a business turn into a reality. Selecting the right name early is important. Once you start marketing your business (Internet, social media, business cards) it may be hard to change it. When deciding a name, choose one that is catchy, yet speaks to the type of business you are in. Consider using "keywords" that tells what kind of business you have. If you are starting out, you have a million things to do. You will be tempted to spend a lot of time on design and layout of your programs...Don't! 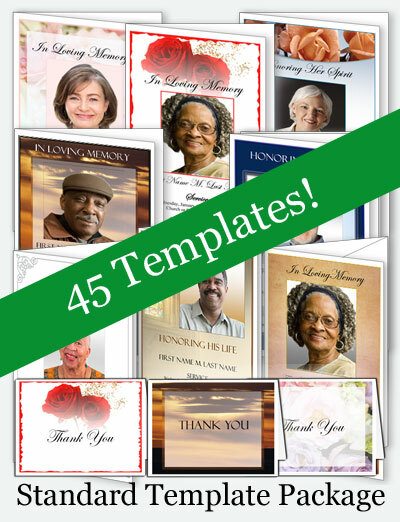 Choose professionally designed funeral program templates from Elegant Memorials. 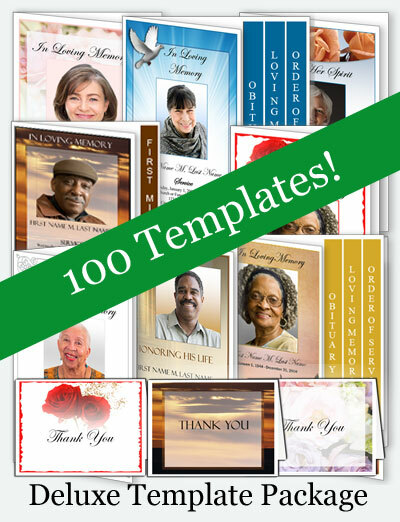 Our templates are easy to use and professionally designed to get you up and running quickly. If you are just starting, you can have the bare minimum, which is a computer (Mac or PC), a Word Processing or Desktop Publishing program such as Microsoft Word, Microsoft Publisher, Apple Pages or a free program called OpenOffice (which is Microsoft Word Compatible). You will also need a printer. Starting out, a basic printer will do. If you do not have a printer, you always have the option of taking your finished program to a printer or copy shop and have them print your copies for you. Once you've done a few jobs, you may want to consider additional equipment, such as scanners, high-speed or large format printers, folding machines and other equipment. Remember, don't get carried away until your company starts getting customers. Create sample programs from your templates. 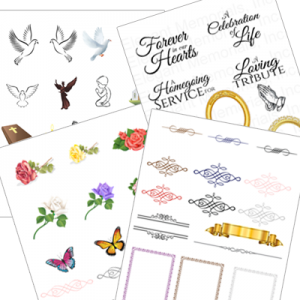 Make the samples are as realistic as possible by adding clipart, photos and realistic information such as a sample order of service, poems scriptures and other information. 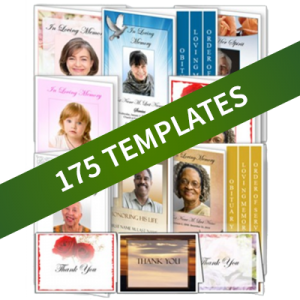 Samples will help you get comfortable with using the templates and familiarize you with the information that you will need BEFORE you have the pressure of a customer and a deadline. It will also give you real samples that you can show your customers. 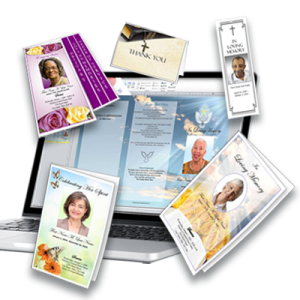 Typically, funeral and memorial programs contain a combination of the following information: an order of service, obituary and tributes, poems, scriptures, readings and much more. Do a little research so that you can make suggestions to your customers, if they need assistance. Remember, many customers are overwhelmed and busy and may need you to make suggestions and educate them. Being prepared with information (and samples) can help you win customers and repeat business. Get the word out! Market your business. You have to let people know that you are open for business. You can, of course, pass out business cards, brochures and flyers to potential customers. Technology now lets us market and publicize our business quickly and for cheap. Social media sites such as Facebook, Twitter, and Pinterest, and of couse a company website, are a great way of letting people know that you are in business, and showcases your products and services.